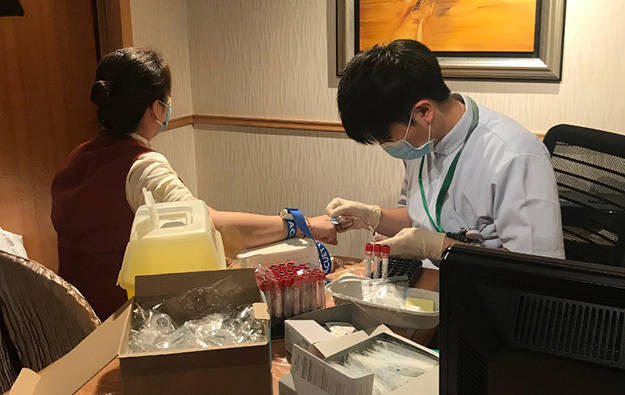 Macau’s Health Bureau says that in the first 14 days of this month, a total of 12 people recorded as working at Macau casino resorts was confirmed to have caught rubella, a disease also known as German measles. The 12 – said to be workers either at the City of Dreams casino resort on Cotai or at the StarWorld Hotel on Macau peninsula – constituted a majority of the 19 rubella infection cases to date this year, the bureau noted in a Sunday update. Macau had an aggregate of 18 rubella cases reported citywide in April. Last week, the Health Bureau had confirmed six staff from City of Dreams – four of them Macau residents – had been diagnosed with rubella. Five out of the six workers affected at StarWorld were Macau residents, according to the bureau. Some of the local-resident casino staff with rubella were born in mainland China, and had an “unclear history” of vaccination against that virus, the bureau had noted last week. Rubella is a disease preventable by vaccination, according to World Health Organization. Complications linked to the disease include the risk of miscarriage or foetal abnormality for women who contract it in the early stages of a pregnancy. City of Dreams, in Cotai, is operated by Melco Resorts and Entertainment Ltd. StarWorld Hotel, located on Macau peninsula, is a casino resort run by Galaxy Entertainment Group Ltd.
GGRAsia approached the two casino operators for comment on the rubella infection cases, and asked them what further operational steps they might be taking in the light of them. In a written reply, a spokesperson for Melco Resorts said on Monday that the company had taken “immediate measures” to sterilise all areas of its property were the affected employees work in order to “prevent the disease from spreading”. GGRAsia had not received a statement from Galaxy Entertainment by the time this story went online. The Health Bureau said on Sunday that it had been working to locate those that had been been in contact with any of the rubella patients identified locally. The bureau had also “instructed” local employers of all infected people to “reinforce disinfection” in the workplace and “make proper arrangements” for any pregnant staff with “no immunity” to the rubella virus – i.e., thought to be unvaccinated – according to its Sunday press statement. The bureau had sent nurses to extract blood samples from all pregnant staff at StarWorld Hotel on Friday (pictured) by checking their antibody profile for signs of immunity to rubella. This task had been due to continue into Monday, according to the Health Bureau. Children and adults infected with rubella virus typically show symptoms including a rash, fever and swollen lymph glands, according to the WHO. Rubella can be transmitted by airborne droplets when infected people sneeze or cough. Lam Chong, director of the Disease Prevention and Control Centre at Macau’s Health Bureau, had noted in an April 10 press briefing that a “small-scale” outbreak of rubella in the city was possible, and acknowledged cases had been recently recorded in mainland China and Japan. The official stated that as many as 25 percent of “Macau residents” might not have immunity to rubella. Two routes to immunity are either previous infection or vaccination. Macau introduced a vaccination programme against rubella in the 1990s, Mr Lam noted, adding that in recent years there had been only a handful of rubella cases reported annually in the city. Last month, the Health Bureau announced local cases of measles infection. Two related to staff working in local casino resort properties. Measles is a highly-contagious disease according to the WHO. Macau had registered over 30 cases of such infection this year, according to published information from the bureau.